City residents’ flooded the port in small boats and lined the sidewalks to show their disdain of the cruise industry, which they believe is responsible for eroding the lagoon and diluting city culture. Residents’ ongoing protests have successfully halted a project to extend the city pier. Photo by Tony Hisgett. 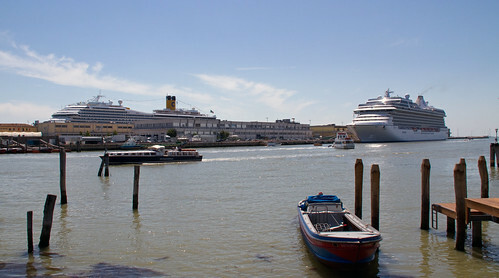 Protesters who want large cruise ships banned from Venice caused delays Sunday for several vessels departing the city, industry watcher Seatrade Insider is reporting. The news outlet says the 3,000-passenger Costa Fascinosa, 1,712-passenger MSC Opera and 2,536-passenger MSC Musica left Venice several hours later than scheduled after a flotilla of small boats manned by the protesters took to the water. Hundreds of protesters also lined waterfront areas.